In any case we have a new E-Bay identity "veloorange". 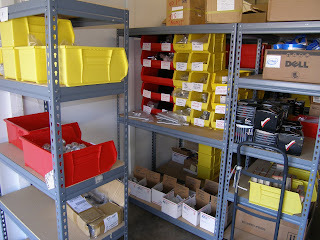 I'll add lots of component and accessories listings as over the next few weeks. Apparently it takes a few hours for the items we list to start showing up in searches or in the "Items from this seller" link, so please check back this afternoon. As our longtime customers know, we often run out of certain products. There are several reasons for this. With new products we typically place a smaller first order. I want to know if the production quality is as good as the samples we saw. It's not unheard of for a sample to be the very best example from a run. I also want to know if a new product will be popular before committing to a large inventory. 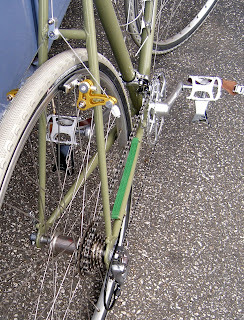 For example, I thought the Grand Cru long reach brakes would sell like crazy given how well they work; they have been a good, but not phenomenal, seller. The VO Stem Adapter, on the other hand, a product that I thought would be only a modest seller, has proven very very popular. Being a new company, we have a disproportionate number of new products. Of course, there are also occasions when I blow it and simply order too few of something. Production delays often cause items to be out of stock. Some popular items are made in small factories that that take as long as six months to make and ship orders. Unfortunately, it's not as easy as just ordering early. Our business is not static. VO continues to grow quickly so it is difficult to predict what we'll need in six months. So why don't we simply take backorders? One of the reasons is that I try to keep this business simple and enjoyable. Another is that our software does not support backorders. But more importantly, we couldn't guarantee when, or even if, something will be back and at what price. Most people would be hard pressed to order something if they didn't know when it would arrive and how much it would cost; I wouldn't. And many folks will find a substitute in the meantime. Our plan is to eventually have a function that will allow customers to sign up for automatic e-mails when an out of stock item they want is back. 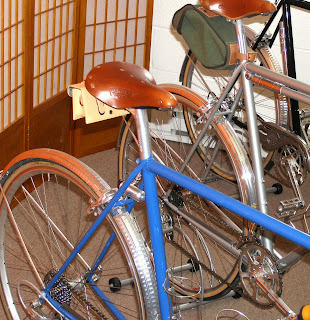 We have a new shipment of Porteur racks, but I'll bet they won't last long. These racks usually sell out almost as soon as we get them in. They are in short supply because shop that makes them for us can't increase production to meet demand. But we've found a couple of willing factories to supplement supply. There is one issue, however; one factory can make them at considerably lower cost, but can't polish them. They would come with a "sandblasted" finish. 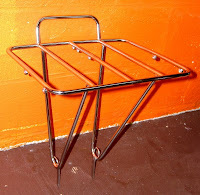 So the question is, would our customers prefer a rack that was $20-$30 cheaper, but not polished? Before you ask, we can't have both; the minimum production run would be too large. I'm leaning toward getting them polished. 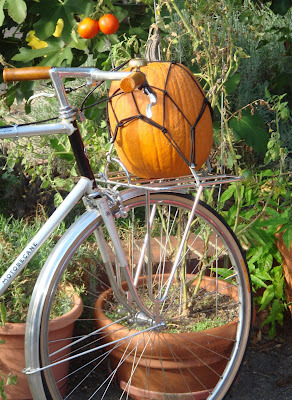 By the way, the upper photo shows an older version of the rack (different back loop), but I thought the pumpkin was appropriate to the season. The 700 billion dollar bailout bill that was enacted last week has it's share of detractors. In the opinion of many economists it had to be passed, but it wouldn't do much good. 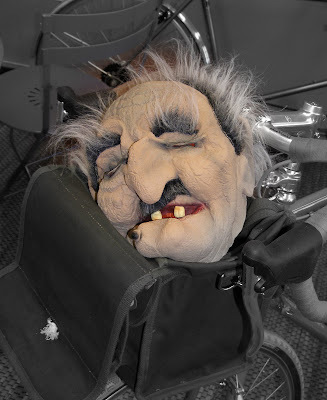 Events over the past couple of days seem to bear that out; of course it's still early. In the end though, this downturn, like all previous downturns, will pass. In any case, to get the last dozen votes needed to pass the bill a lot of extensions were added, some good and some bad. One of the good ones was The Bicycle Commuter Act which will provide a $20 tax credit per month to employers of bike commuters. That's only $240 a year, but it's enough for tires and some bike of upgrades. Be sure to ask your employer to participate. Here's a link to a Wired post with more details. If you want to read more about economics and the credit crisis I highly recommend (the only occasionally wonkish) Economist's View blog. Brian suggested Espresso bar. That's actually Italian, but still sounds great. Kevan's suggestion Flarrow, from flat and narrow, was also a favorite. The winner, however, is Matt's suggestion of Belleville, another Parisian neighborhood in keeping with our VO Left Bank and Montmarte bars. 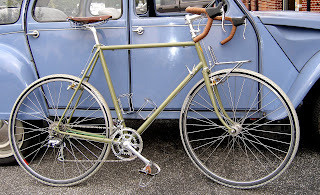 And, as he says, "a nod to a great bicycling movie, The Triplets of Belleville." All three folks mentioned above will get free handlebars. Please send me an e-mail with shipping info. I wanted to mention a few other great suggestions. Flaneur, suggested by Pavel is a super name, but we were thinking of calling the production mixte the Flaneusse, so too close. Chris' Cintre-Ville is neat and noteworthy; maybe for the next bar. As are Melvin's Bridget Bar-Deaux and Tony's Camionnette (which we are saving for a rack name). Finally, Libraridan's Madeleine, with it's link to Proust, is a wonderful suggestion. 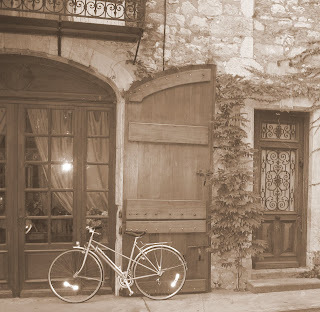 Remember the vintage French bars in the photo? 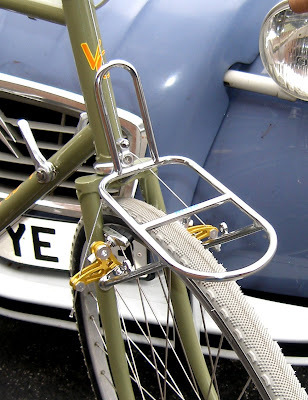 They were a standard bar on countless French city and utility bikes for many decades. I wrote about wanting to make them again a few weeks ago. Here's what happened; I found it interesting. I made some measurements and drew a rough sketch that we gave to our draftsman. He made a proper set of plans that we sent to our agent in Taiwan. The agent contacted several manufacturers. The first manufacturer was a large company whose name you are certainly familiar with. They asked a large fee for tooling and a huge first order. The second company, a medium sized handlebar manufacturer, wanted a smaller amount for tooling and required a much smaller order. The third company was a new and rather small manufacturer who would absorb the cost of tooling and required an order of only 200 bars. Their per piece cost was a bit higher, but still reasonable. Since this bar is narrow and very simple in shape I felt we could trust this new company with it. Besides, Tom had already worked on a project with them, in his former job, with good result. We had almost settled on the third company when our agent sent us a new drawing that was virtually identical to the one we had sent her. It varied by 2-3mm in one or two dimensions. Obviously someone else had had the same idea as us. They had copied the same bar. It seems a fourth manufacture had once made these bars for an unknown company and so already had the tooling and experience to produce them. The cost was somewhat higher as was the minimum production run. But this company has a great reputation and we could skip all the prototypes and minor revisions and inevitable tooling delays. We should have these bars in 60-90 days. They are narrow, about 44cm (O-T-O) for slipping through traffic. There is zero rise. 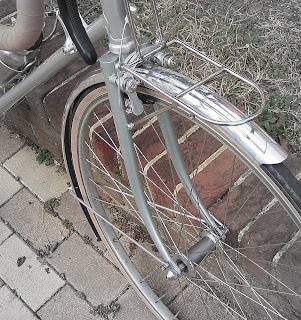 The bar diameter is 23.8 to accept inverse levers or bar-end shifters. Clamp diameter is 25.4mm. Cost should be around $20. So the question is, what should we call them? 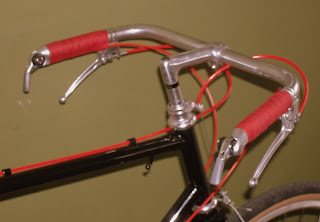 I'll offer a free set of these handlebars for the best suggestion! 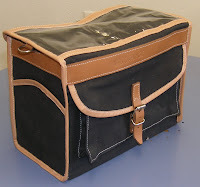 I thought I'd post a couple of photos of the final VO handlebar bag design. It's a little taller than the last prototype. The production version will be of treated canvas; this one is plain canvas. Otherwise, this is it. The projected price is around $90.